Children will be transitioning back into school mode with the start of classes, practices and after school activities. Bring on the extracurricular; bring on the carpools! BubbleBum, the inflatable booster seat designed for on-the-go families, knows the importance of safety and travel. Below are the best safety tips for carpooling families and friends heading back into the school season. Make a schedule, make a plan. Whatever your carpooling needs, discuss your schedule upfront with all parents involved so their isn’t confusion who goes where, and who picks up who on each day. This can get tricky but if there is clear communication right away, parents will know what their responsibilities are and where each child needs to go. Having a printed schedule for the carpool is always a safe bet. Have all the “extras” on hand. Check in with each parent about safety and medical concerns their children have. Share with other parents your children’s needs as well. If you have a child on your carpooling schedule that has allergies, make sure you are carrying the proper medications and know how to use them in case of an emergency. It’s always best to be prepared for the worst case scenario! Keep toys in the car. For travels that get a little long, having non-distracting toys in the backseat is not a bad idea to keep your kiddos inline and occupied for the drive. Puppets, handheld games, dolls and action figures are all safe bets for the car that won’t make a mess. Have all parents’ contact information at your fingertips. Compile a list of people, addresses, phone numbers and backup phone numbers for each carpooling family. Keep the list in your vehicle so you can easily add an address to your GPS or dial a phone number. Also, make sure all contacts are in your cell in case you need to get a hold of someone fast. Model safe behavior for the little ones. Backseat riders are tuning in on mom and dad during the travel, so make sure you are practicing safe behaviors while driving. Avoid texting and taking phone calls while driving and insert addresses in your GPS before you take off. Playing loud, fun music is entertaining for the kids, but don’t overdo it. Teaching children safe driving practices will only begin to prepare them for safe, smart driving when they reach their teenage years. 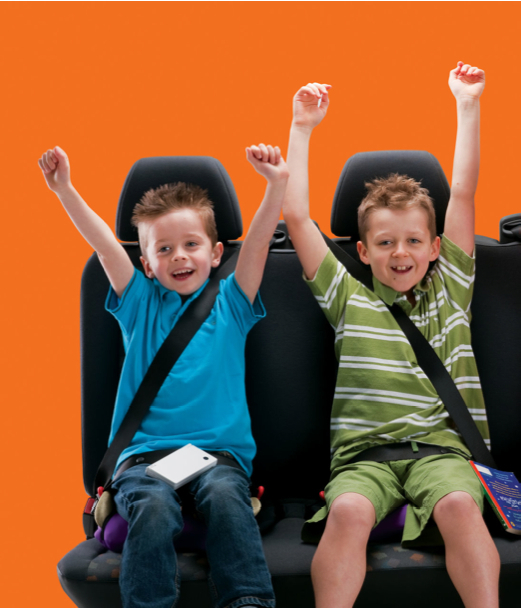 For carpooling families, parents can feel secure knowing their child is getting the proper booster seat she needs during all her travels! BubbleBum is the first inflatable and lightweight booster seat so after use children can easily deflate, roll up, and place it in its handy sack for easy transportation. Children may store BubbleBum in a backpack, locker, or trunk until the next car ride. The excellent design makes after school trips to a friend’s house or practice easier than ever! BubbleBum retails at $39.99, sold online, www.bubblebum.us, and now available on Target.com and BabiesRUs.com. For more information on BubbleBum, visit them online: www.bubblebum.us. Follow them on Twitter, on Pinterest and “like” them on Facebook.